Signup for an Account Today! Request an account with us! If you're looking for the best possible deals for your business, you've come to the right place. Direct Automotive Distributing offers an extensive variety of auto parts in dozens of aftermarket brands, to wholesale parts and Original Equipment (OE), as well as domestic and foreign offerings. With our all-inclusive website, you have a virtual, one-stop auto parts warehouse available with just a click of a mouse. An extensive multimillion dollar auto parts inventory. On-going programs and special offers. Immediate assistance by our team of knowledgeable and experienced professionals. Dedicated attention and care by our sales representatives. Direct Automotive Distributing (DAD) is the Northwest’s auto parts distribution leader. DAD is a major supplier of ACDelco and other quality automotive brands such as Motorcraft, LubeGard, Loctite, Monroe, Stant, Dorman, Fel-Pro, 3M, SKF Bearings, and Oil Seals. DAD supplies across the wholesale market to dealers, jobbers, fleets, and installers. Customers are helped by Direct Automotive Distributing’s knowledgeable parts and sales professionals. The team members leverage their expertise in parts, stocklifts, promotions, and training. In conjunction with ACDelco training instructors, Direct Automotive Distributing has educational partnerships with Spokane Community College, Columbia Basin Community College, and Walla Walla Community College where over 500 installers are trained every year. Six main store locations in Spokane, Pasco,WA and Missoula, Great Falls, Billings MT and Idaho Falls, ID are owned and operated by Direct Automotive Distributing to supply Eastern Washington, Eastern Oregon, Montana and Idaho. With a combined warehouse size over 52,000 square feet, and a large fleet of trucks, Direct Automotive is able to service a large range of clients in the Northwest. Direct Automotive Distributing knows batteries. 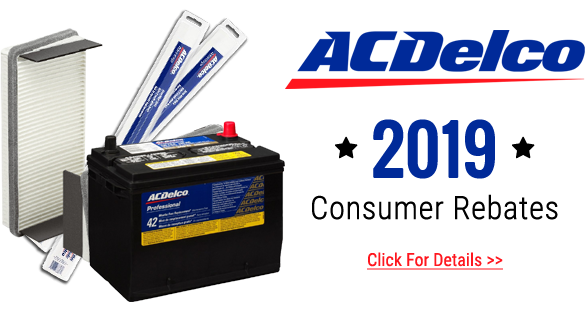 The ACDelco battery trucks of Direct Automotive Distributing are continually serving the area, providing over a thousand batteries each month. In addition to the battery trucks, Direct Automotive Distributing moves batteries out of the warehouse regularly for area installers, jobbers, fleets, and dealers. To set up an ACDelco Battery Consignment Rack, call 1-800-324-3284 and ask to be contacted by one of our battery marketers. Thank you for your interest in Direct Automotive Distributing. We are proud to provide quality auto parts and expertise, and look forward to serving you in any way. Call us today to find out how our professional team members can help your business.